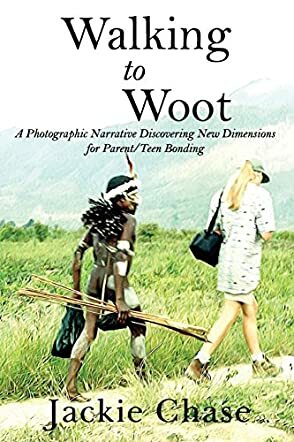 Walking to Woot: A Photographic Narrative Discovering New Dimensions For Parent/Teen Bonding by Jackie Chase is a true account of a mother-and-daughter’s journey together into Papua New Guinea and all of its accompanying adventures and insights. Walking to Woot starts with Jackie and her teenage daughter, Katherine, embarking on an once-in-a-lifetime journey to Papua New Guinea and into a world still relatively untouched by civilization. Their one-month-long excursion is documented fully as we hear their stories - full of adventure, fun, discomfort, and traveling with the bare necessities - which offer a rare glimpse into the lives and culture of the various tribes that inhabit Papua New Guinea. In the end, Walking to Woot is more than the journey; it also tells the story of how a mother and daughter became a team and formed a new bond as they experienced a new world. Walking to Woot: A Photographic Narrative Discovering New Dimensions For Parent/Teen Bonding by Jackie Chase is an immensely enjoyable book written superbly by Jackie Chase. I felt that I was able to get a true, unadorned glimpse into the life and society of various tribes that live in Papua New Guinea such as the Dani, and to truly understand a region that may be one of the last untouched places left on earth. I also loved the fact that Jackie truly empathizes with the locals she meets and has a very open, accepting mindset. Her bonding with Katherine is also a great lesson in parenting. All in all, a wonderful read for all travel or parenting enthusiasts. Walking to Woot: A Photographic Narrative Discovering New Dimensions For Parent/Teen Bonding is a non-fiction travel memoir written by Jackie Chase. Chase is a photo-journalist who spent a month in the jungles of New Guinea with Katherine, her 14-year-old daughter. Their time in New Guinea began with their selection of a guide, and they chose a young man named Julius, who would alternately charm and infuriate them during their month-long stay. The two spent their time visiting with the Dani tribespeople, who had very basic and traditional lifestyles. Dani men and women lived in separate housing, and a woman who attempted to enter a man's dwelling without permission, even if it belonged to her husband, could be shot at with an arrow. More intriguing to both mother and daughter, however, was their discovery that the Dani did not compete with each other and instead worked together in a spirit of cooperation. As their month in New Guinea progressed, the two of them also found that, for the most part, they had discarded the mother/daughter dynamic, and a friendship and working partnership between two women had grown in its place. Jackie Chase's cultural travel memoir, Walking to Woot: A Photographic Narrative Discovering New Dimensions For Parent/Teen Bonding, is a fascinating look at another world through the eyes of Chase and her daughter. I loved reading her descriptions of the natural environment, the wildlife and sometimes hazardous plants they encountered in the jungle and the villages they visited. The two travelers showed impressive resilience in the face of the thousands of stinging insects, primitive or non-existent plumbing and straw bedding that became their norm during the trip. Chase's memoir is a compelling and well-written non-fiction offering that reads like an adventure tale. Walking to Woot: A Photographic Narrative Discovering New Dimensions For Parent/Teen Bonding shows how a mother and daughter bonded during their jungle adventure, but even more so, it gives the reader a look at a tribal culture that's far removed from modern times and places. This travel memoir is most highly recommended. Walking to Woot by Jackie Chase is the author’s account of a journey into the jungles of New Guinea with her daughter, Katherine. An adventure into an almost undiscovered and wild world, where everything is basic and everyday life is just about as hard as it gets for a westernized mother and daughter. It is a journey not just about the reality of life in a timeless world, but the opportunity to strip oneself of the trappings of the modern world and experience the all-encompassing, everyday challenge of survival. Coupled with that is the chance to examine one’s inner self, to have the time to contemplate emotions, and to be part of a culture that is virtually pre-historic, yet beautiful in its own way. The author, Jackie Chase, has created a very emotive account of her journey with Katherine into the wilds of such an unknown country. Some of us might have chosen a less hostile environment for their journey of self-discovery, but all credit to this mother and daughter whose incredible experiences enabled them to discover their own true selves. In addition is the clear bonding that developed with these shared experiences. The writing is energetic and descriptive and takes the reader into the desolate world of New Guinea. Not only is the book an engaging read, but it is inspiring and, I found, an encouragement to try new things and to escape the trappings and bindings of the modern world. For those who are not brave enough to take on such a challenge, they can experience it from the comfort of an armchair by reading the account of Jackie Chase and her daughter, Katherine. Walking to Woot: A Photographic Narrative Discovering New Dimensions For Parent/Teen Bonding by Jackie Chase is an exciting book that speaks about the diversity around us. The book is also about the bonding between Jackie and Katherine, a mother and daughter, as they traverse the wilds of New Guinea's jungles. The jungle environment works as a catalyst for developing the relationship between the mother and daughter. As they travel through dangerous terrain, they realize that, more importantly than the destination, one should be equipped to meet the day to-day challenges. As the story progresses, readers are allowed a peek into the jungles of New Guinea and also to reconnect with their inner selves. The story also helps in building up one's self confidence and passion to search and discover. The underlying spiritual tones give another dimension to the story and a mystical vibe to the narrative. It's nice to see how the differences between the mother and daughter slowly turn to become similarities. It's a story of grit and determination that will motivate readers to explore the many layers that exist in the world around them. The narration is detailed and descriptive, making the book very visual. The individual diversities in the story give readers a better understanding about life and will make them reflect on life. The depth in the story and the bonding between the mother and daughter make it a compelling read. It's a story that will captivate readers with its many dimensions and travel details. Jackie Chase shares a rare mother and daughter adventure in Walking to Woot. Jackie and her fourteen-year-old daughter, Katherine, long for a simpler lifestyle. Relying on each other, they left the distractions and the comforts of the modern world and embarked on a journey into the jungles of New Guinea. Their mission was to explore and live among the Dani tribe for thirty days. Living among the Dani revealed who they really were and what they were made of. Over time, they lost their masks of protection that hid their insecurities. Threats of bugs, snakes, poisonous leaves, hunger and malaria enabled them to discover inner strengths and solidified an unbreakable trust between them. The threats and hardships did not compare to the joy of discovering the serene beauty of nature, exciting hellos, sad goodbyes, or the priceless, treasured friendships forged along their way. Walking to Woot is a memorable literary journey. Jackie Chase pens her profound, soul-searching story in a charismatic memoir. Written from her point of view, she allows the reader to explore the emotions and realities of living among the Dani. As a reader, you can empathize with her and Katherine as they trek through the New Guinea jungle. Chase portrays the jungle in a picturesque and figurative style; she uses exquisite descriptions, drawing from her keen photographic eye. The narrative is told as a sequence of events, highlighting the conflicts and dramatic moments of the journey. Not only did she share her experiences, but Katherine's insights as well. The story took on a level of uniqueness when Chase expressed her personal thoughts, things she questioned about herself, her daughter and the world around her. Furthermore, Chase does an excellent job at weaving the analogy of wearing masks throughout the memoir. I really enjoyed reading Walking to Woot; it is truly a one of a kind, unforgettable journey.